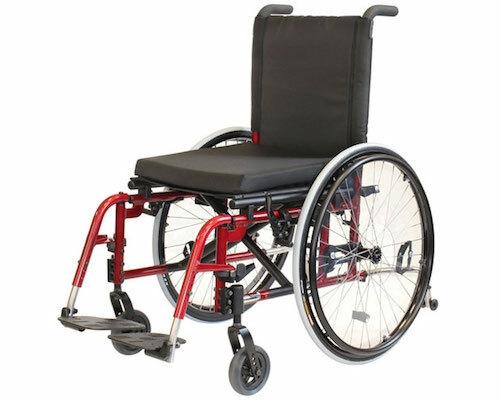 FOLDING FRAME ADJUSTABLE POSITION EVERYDAY WHEELCHAIR. If you require a folding wheelchair – look at the Condor. Its variations are designed to accommodate a wide range of different needs for people who have been affected by an injury or illness. Front hangers – that your footplates attach to – can be made at any angle and footplates can be “one piece drop in”, “fixed, flip up” or “swing away flip up”. The variations are endless. Well-engineered moving parts ensure frame reliability and durability of this fully adjustable folding wheelchair. Get moving in a Melrose Condor. Melrose Wheelchairs are custom-made to measure and a script form needs to be filled out before ordering. Contact us if you’re not sure how to fill out the script, we are happy to help!